On the evening of Sunday 9th February a plethora of top comedians including Sean Lock, Alan Carr, Jo Brand, Jack Dee, Dara O Briain, Omid Djalili, Paul Whitehouse, Charlie Higson and Stephen K Amos, will be amongst those performing at Stand Up For The Felix Dexter Foundation. The benefit is being held at The Eventim Apollo Hammersmith in London to help raise funds for the new foundation set up in memory of the much loved, talented and articulate comedian who died tragically young on 18th October. Other performers include Curtis Walker, Alistair McGowan, John Simmit, Felicity Ethnic, Jocelyn Jee Esien (Little Miss Jocelyn), BiBi Crew, Leo Muhammad, Victor Romero Evans and Eddie Kadi. Felix’s will provides for the setting up of a fund to help educate children in the UK and St Kitts who come from underprivileged backgrounds. Being born and raised in St Kitts in the West Indies, coming to Britain when he was seven years old, this was particularly important to him as his mother sacrificed her own education to ensure he had the best she could give him. The newly formed Felix Dexter Foundation has these educational aims at the forefront, as well as supporting other causes in the UK and worldwide which support cancer and sickle cell research, organ donation and the personal development and social welfare of individuals including the legal and entertainment professions which were so close to his heart. 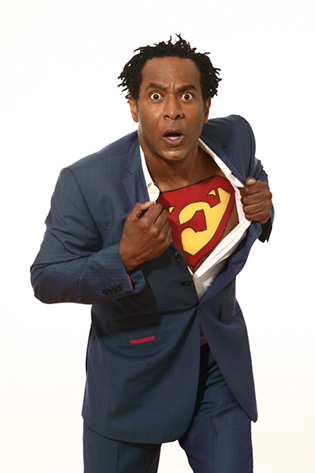 Once named Time Out Comedian of the Year, Felix Dexter was born on 10th February in Saint Kitts in the Caribbean. He moved to Surrey with his family at the age of seven. He studied Law at University College London and began training as a barrister before embarking on a career in comedy. A pioneer of black comedy, his many, varied and very, very funny television and radio credits include: Down The Line, Bellamy’s People, Absolutely Fabulous, Have I Got News For You, Knowing Me Knowing You with Alan Partridge, The Lenny Henry Show, The Real McCoy and, most recently, Citizen Khan, the second series of which was screening when he died. Felix also starred on stage opposite Hollywood actor Christian Slater in One Flew Over the Cuckoo’s Nest, as well as spending a season performing with the Royal Shakespeare Company. A modest and private man he died after a long and dignified struggle with myeloma, a type of bone marrow cancer. The event is being organised by Paulette Randall who worked as Associate Director alongside Danny Boyle to bring the spectacular London's Olympic Opening Ceremony to the big stage in 2012, watched by a reported billion viewers worldwide. The first black British woman to direct a play in London's West End, her very first prize-winning play Fishing was directed by Boyle at the Royal Court in 1982. She went on to produce a host of television successes including Desmond's and The Real McCoy and has directed smash-hit musicals, Shakespeare and new writing in London and elsewhere. She was chair of the Clean Break Theatre Company and is former artistic director of the Talawa Theatre Company.